Don&apos;t get hung-up on the technology too early. It&apos;s about understanding the business problem and having the right people and processes. Buying a BI solution is a complex undertaking, not just because of the large number of options available, but also because there are many different kinds of products, designed to do very different things. But the technology is not even the most important thing. All of the experts we interviewed for this guide were unanimous: Don&apos;t start with the technology! Perhaps the most important first step is to secure executive sponsorship with enough clout in the organization to telegraph the seriousness with which the organization is approaching the project. This is the most important overall factor. 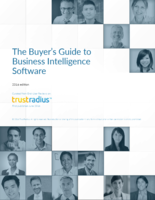 Procuring a BI solution is a business decision. Only the business really understands the problems to be solved and the value that new technology can bring to the organization. Buying BI technology should never an IT-only decision and this is something that needs to made very clear from the start. BI tools can be notoriously difficult to use and it&apos;s important to understand the range of user types that will be using the software. The largest number of users are likely to be relatively non-technical executives, operations staff or salespeople who need the ability to monitor metrics, analyze anomalies and drill down to see details. A far smaller number will be technical users like data analysts or even highly-trained data scientists and modelers who really want to be able to explore large data sets. It&apos;s important to understand the abilities of your users and to not overestimate the abilities of the largest part of the user population. It&apos;s critically important not to try to boil the ocean, but tackle a small bounded product and show some quick results. For example if executives from different departments cannot agree on sales numbers because they have different definitions of “product” and are working from different spreadsheets, agree to track a couple of metrics to help solve that problem. Early success of this kind is the best way to build confidence in the program and ensure continued buy-in.